I've been writing and playing music for a number of years and lately have been using Apple's GarageBand to capture my writing ideas. It's certainly not a fully fledged DAW, but I've found it to be more than adequate for getting an idea fleshed out to a demo quality recording. The more I have used GarageBand, the more I have found its limitations (although these are not unreasonable limits for the application that it is). The main one for me is that the software instruments are a minimal set, some of which are what I would consider novelty sounds (basically unusable) and others are flawed with pitch issues (e.g. Fretless Electric Bass). Coupling this with not being able to MIDI OUT to an external device (of which I have a few), the software instrument set can become a bit frustrating. I really don't like the default Electric Piano instrument (sounds too crunchy like a clav to me), I want a sound like a classic Rhodes or a Yamaha DX7, so I decided to find out how to get one without throwing any money at it. Select the instrument group on the Browse tab that you want the instrument to be saved into, and the select icon that you want to be used. Obviously the choice of free instruments available is not as broad as those available for purchase, but there are some good ones out there. There is a good freeware AU list at Don't Crack.com and an extensive list at KVR Audio, although many are only VST plugins, not AU. Just remember that you get what you pay for, so don't be upset if some don't work well. There are a few quirks about using these for instrument sounds. GarageBand will use .sf2 files, but not the archive formats .sfark or .sfpack. Both these formats appear to be abandoned now and unpacking the soundfonts on OSX is next to impossible. 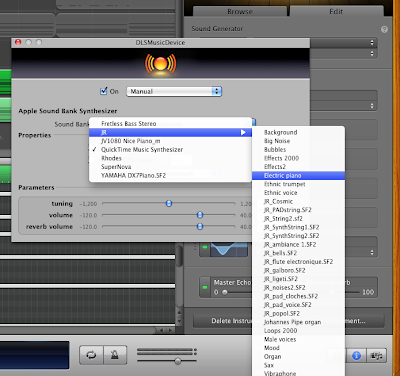 Although some soundfonts are available as "collections", these are a little less easy to use in GarageBand. Unless you can send a MIDI Program Change to the track, you'll be stuck using the first sound/voice in that collection. I tend to use single instrument soundfonts so that I can save them as an instrument once installed. Some sources I have used for .sf2 soundfont files are HammerSound, ЯK Hive, NTONYX and www.johannes.fr. Probably the largest soundfont archive is sf2midi.com, although it has some drawbacks: you need to register to download, the free downloads are slow (and require too many clicks in my opinion), and the zip files cannot be opened by OSX's Archive Utility (10.6) - luckily they can be unzipped by the free app The Unarchiver. Nearly all of the .sf2 files I have tried to date have worked well, but some just don't work. You can save the soundfont instrument so it is listed on the Browse tab by using the same steps outlined above for AU Instruments. 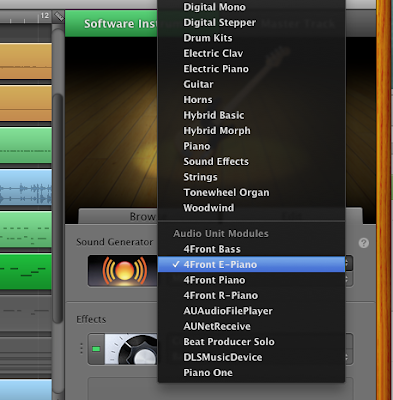 Pro Tip: If you want to organise your soundfont files into instrument types, or to keep a set of files together, etc. then you can create folders within Library/Audio/Sounds/Banks folder and this will be reflected in the Sound Bank list. UPDATE 28-OCT-2012: I just found this post that links to downloads for "3.5 Gigabytes Of HQ Orchestral SF2" at newgrounds.com. I haven't tried them all yet, but those that I have tried are sounding pretty good. I also discovered freesf2.com which also has some great free SF2 files (although you'll need sfArk).